When you have a baby one of the most hilarious games that friends and family instantly play is “who does baby look like” game. The comparisons with Abbey were to my baby picture, George’s baby picture, my adult self, his adult self, and other family members as well. But when Jack was born there was no doubt in my mind that he looked like a “skinnier” version of his big sister, Abbey. 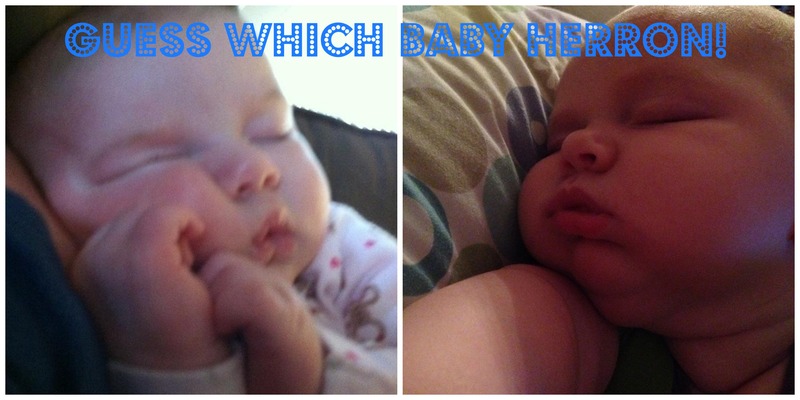 I will agree that Jack resembles others as well like his Grandpa Herron and his baby picture, his Uncle CJ and his baby picture but there is no doubt when you look at the comparison below that my squishy, snuggly babies look damn near identical. Abbey is on the left at almost 3 months old and Jack is on the right at 2.5 months old! The similarities in them are endless and lucky us they are both so damn cute!